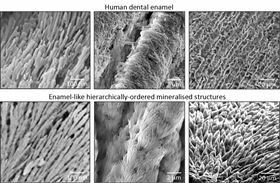 These images show the similarity between the structures of the synthetic enamel-like material and dental enamel. Image: Alvaro Mata. Researchers at Queen Mary University of London, UK, have developed a new way to grow mineralized materials that could regenerate hard tissues such as dental enamel and bone. Enamel, located on the outer part of teeth, is the hardest tissue in the body and allows our teeth to function for a large part of our lifetime despite repeated exposure to biting forces, acidic foods and drinks, and extreme temperatures. This remarkable performance results from enamel’s highly organized structure. Unlike other tissues in the body, however, enamel cannot regenerate once it is lost, which can lead to pain and tooth loss. These problems affect more than 50% of the world's population and so finding ways to recreate enamel has long been a major endeavor in dentistry. As the researchers report in a paper in Nature Communications, their new approach can create materials with remarkable precision and order that look and behave like dental enamel. The materials could be used for a wide variety of dental complications such as the prevention and treatment of tooth decay or tooth sensitivity, also known as dentin hypersensitivity. "This is exciting because the simplicity and versatility of the mineralization platform opens up opportunities to treat and regenerate dental tissues," said Sherif Elsharkawy, a dentist from Queen Mary's School of Engineering and Materials Science and first author of the paper. "For example, we could develop acid-resistant bandages that can infiltrate, mineralize and shield exposed dentinal tubules of human teeth for the treatment of dentin hypersensitivity." In order to fabricate these materials, the researchers take advantage of a specific protein that is able to trigger and guide the growth of apatite nanocrystals at multiple scales – similarly to how these crystals grow when dental enamel develops in the body. This structural organisation is critical for the outstanding physical properties exhibited by natural dental enamel. "A major goal in materials science is to learn from nature to develop useful materials based on the precise control of molecular building-blocks," said lead author Alvaro Mata from Queen Mary's School of Engineering and Materials Science. "The key discovery has been the possibility to exploit disordered proteins to control and guide the process of mineralization at multiple scales. Through this, we have developed a technique to easily grow synthetic materials that emulate such hierarchically organised architecture over large areas and with the capacity to tune their properties." Gaining control of the mineralization process raises the possibility of creating materials with properties that mimic different hard tissues beyond enamel, such as bone and dentin. As such, the work has the potential to be used in a variety of applications in regenerative medicine. In addition, the study also provides insights into the role of protein disorder in human physiology and pathology. This story is adapted from material from Queen Mary University of London, with editorial changes made by Materials Today. The views expressed in this article do not necessarily represent those of Elsevier. Link to original source. Tandem-repeat synthetic proteins work as proton conductors. A novel model derived from more than 400 computer simulations of natural composite materials can help scientists develop synthetic versions.